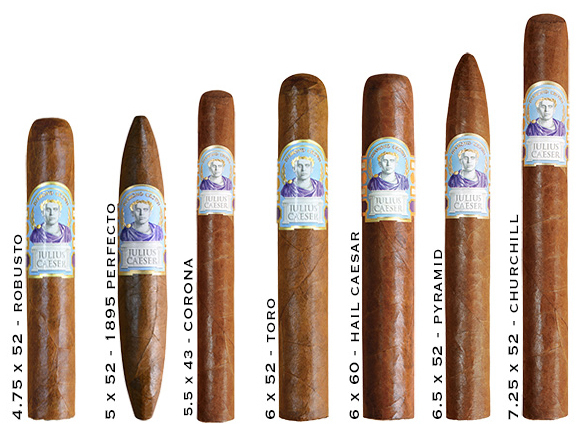 Julius Caeser Cigars - Buy Premium Cigars Online From 2 Guys Cigars . Julius Caeser is (J.C.) in the J.C. Newman Cigar Company , the pioneer and founder of the J.C. Newman Cigar Company. Born in 1875 in a small Hungarian village, J.C. and his family sailed across the Atlantic in 1888 in search of the American Dream. To celebrate J.C.s 135th birthday they created a third Diamond Crown that honors J.C., whose likeness appears on the cigar label. Diamond Crown Julius Caeser cigars are meticulously rolled in small batches at the Arturo Fuente Factory in the Dominican Republic. Especially flavorful Ecuadorian Havana-seed wrappers combine with a smooth, robust blend of fine Central American tobaccos are carefully aged.